Travelling to Winnipeg, Manitoba in the centre of Canada in the middle of winter was not how I intended to spend Valentine’s Day this year. After all, this is a city that CANADIANS refer to as “Winterpeg” due to its extreme winter conditions. However my trip was an expression of love as I travelled to say a final farewell to my Godmother who had lived in the city for nearly forty years and had passed on in January. 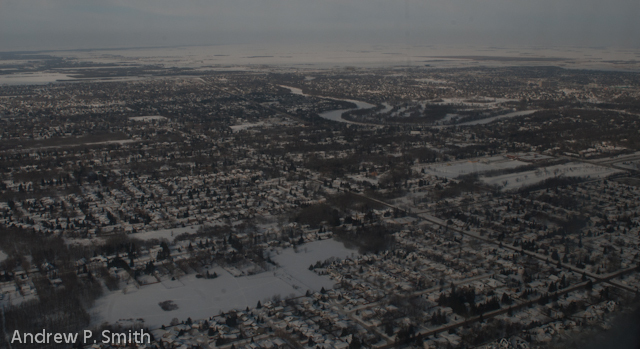 An aerial view of Winnipeg, Manitoba in the grasp of winter. I do not enjoy funerals. I don’t know anyone who does, especially for someone who is instrumental in making you the person that you are. Aunt Sissy is the reason I am a photojournalist. Firstly, she introduced my brothers and I to National Geographic magazine and she also gave me my first cameras. She made it clear that yes, you can be successful following your dreams and she never failed to encourage and support me. My Godmother also emphasised the importance of telling loved ones how you feel about them while they are still alive. I ensured that I did so with her and this helped to deal with her passing. Walking the streets of downtown Winnipeg. 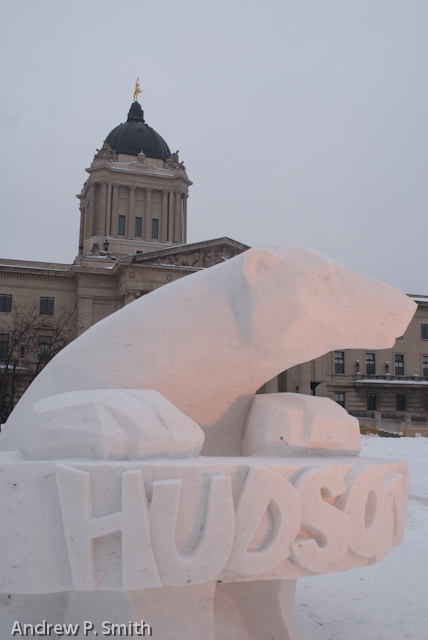 A sculpture of Hudson the polar bear, the newest addition to Winnipeg’s zoo, in front of Manitoba’s legislature building. 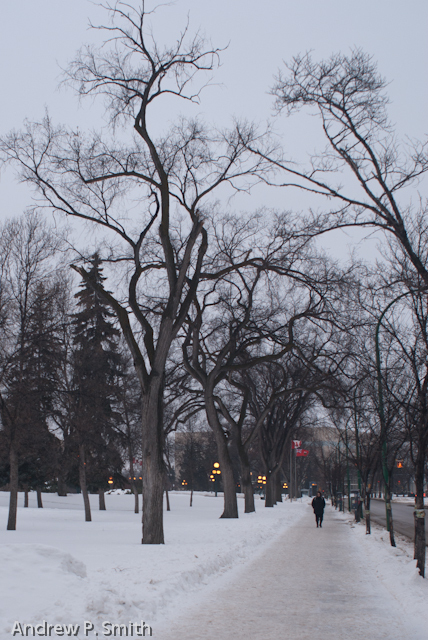 The day after the funeral I decided to brave the winter morning and shoot in downtown Winnipeg. After all, Aunt Sissy would find it ridiculous that I came to Winterpeg and not do any photography. So I dressed accordingly for the relatively warm -7° C temperature (it can get down to -40° C), and stepped outside with a 24mm, f/2.8 lens attached to my D200. There were a number of aspects to shooting in unfamiliar conditions that can be challenging. Firstly of course is the weather. I’m used to temperatures of 28° C and the granular white stuff on the ground being sand, not snow. (Yes, it was the first winter that I can remember – anything that I experienced before three years old I have problems recalling). However, I soon warmed to the conditions, although I had to fight the images of frost-bitten, snowed-under photographers that kept appearing in my head. I always tell my students that “the more time spent with the subject, the better the photos”, and “spend time shooting from different angles”. It’s a lot easier to do this in Jamaica than in “Manislowba”. My initial approach was to shoot and walk. Eventually I slowed down, stood still, looked, composed and yes, squatted in the snow to vary the angle. The walk lasted just over half an hour until the wind chill started to get to me. It resulted in just a few shots. I like to think that Aunt Sissy would have liked them. 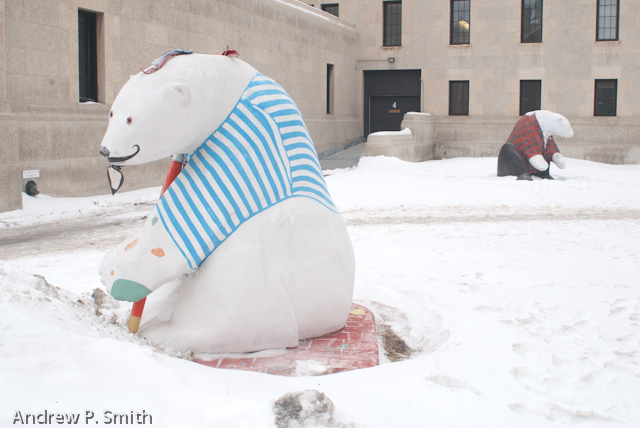 More Polar Bears on the streets of Winnipeg. I first discovered the Buff Bay Valley of eastern Jamaica twenty years ago as a young photographer when carloads of us would drive around the island on a weekend seeking new places to photograph. We didn’t always find the places we were looking for, but we were guaranteed a great time and great images. Being a part of a group of like-minded individuals allowed us to teach each other about seeing, composition and the finer aspects of photography. These experiences and the resulting synergies are what motivated me to become a professional photographer. Fifteen years later I returned to the Buff Bay Valley as a news photographer, documenting the effects of natural disasters. I discovered a cottage for sale which I eventually bought and over the past five years I have come to know the valley very well. The danger of becoming so familiar with an area is that you can take for granted your surroundings, resulting in a loss of the drive that initially motivated you. So how do you rediscover that drive? Fortunately, for the past two weeks I have been working with my colleague Gabrielle Blackwood in the valley. A talented video story-teller, Gabrielle is a neophyte to the location and this has allowed me to see the attractions of the valley – from the coastal town of Buff Bay to the Blue Mountains 4,000 feet up – through another’s eyes. I am now able to see, appreciate and photograph the mountain vistas, hidden waterfalls and friendly people with the enthusiasm that I had when I was learning my craft. Buff Bay (Jamaica) from Gabrielle on Vimeo.